It’s been years since we’d eaten at Chinois in the Forum Shops. No excuse really, just that we always thought we could get as good or better stuff up and down Spring Mountain Rd. for a third less $$$. Be that as it may, there’s no denying the people-watching pleasure of sitting on Chinois’ outdoor-indoor patio, and some things they do here, they do very well indeed. They call it Asian-fusion cuisine, and that’s what Puck was doing in the early ’80’s when we first ate at Chinois on Main in Santa Monica (where, btw, we shared the spotlight with Kareem Abdul-Jabbar at another table). These days, the menu (here in Vegas anyway), seems to be an all-purpose, pan-Pacific review of best hits from a half dozen countries — some Korean short-ribs here, a Thai curry soup there — but all of it is done with top-flight ingredients and cooked about as well as these dishes can be. The nigiri sushi for example, always comes on subtly perfumed, slightly warm, vinegared rice — the perfect foil for a piece of well-sliced, cool tuna. And the miso-sake-glazed black cod is as good a rendition of this overdone recipe as you will find. And the bento box is a steal (and a nice healthy lunch) at $19 — even if the spicy salmon roll is mushy and not-that-spicy — and the Indonesian steak tartare is spicy (and fruity), but kind of a blob of fruit-flecked meat. 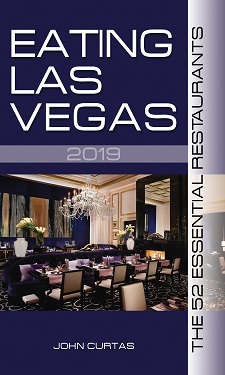 As for the prices, they’re still not cheap — the $47 ELV paid for lunch would feed a family of four on Spring Mountain Road — but you’re paying for superior, careful cooking here, and one of the great venues to watch the human highway of Vegas tourists pass by. Speaking of prices, the lunch and dinner menus here are almost identical, with lunch items priced between $4-$8 less than the larger portions at dinner. So a midday meal does both your waistline and pocketbook a favor. Could your note about Chinois being quiet be related to the fact a 1000% security sweep was in progress prior to the arrivial of POTUS? Just a thought! Hooray, mediocrity! Chinois is just another asian fusion joint that struggles to get anything right with any measure of consistency. I’d rather go to Ping Pang Pong for Chinese, then stop by Raku for some Japanese, then wheel back around to Lotus of Siam to finish off the fusion with some Thai. Even with the gas money spent it would be cheaper and much, much tastier.